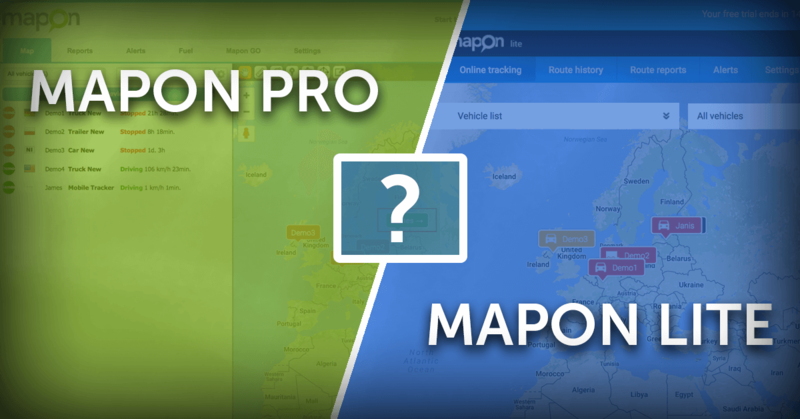 Mapon Pro and Mapon Lite are two separate products with different functionality – both of them are based on Mapon system. 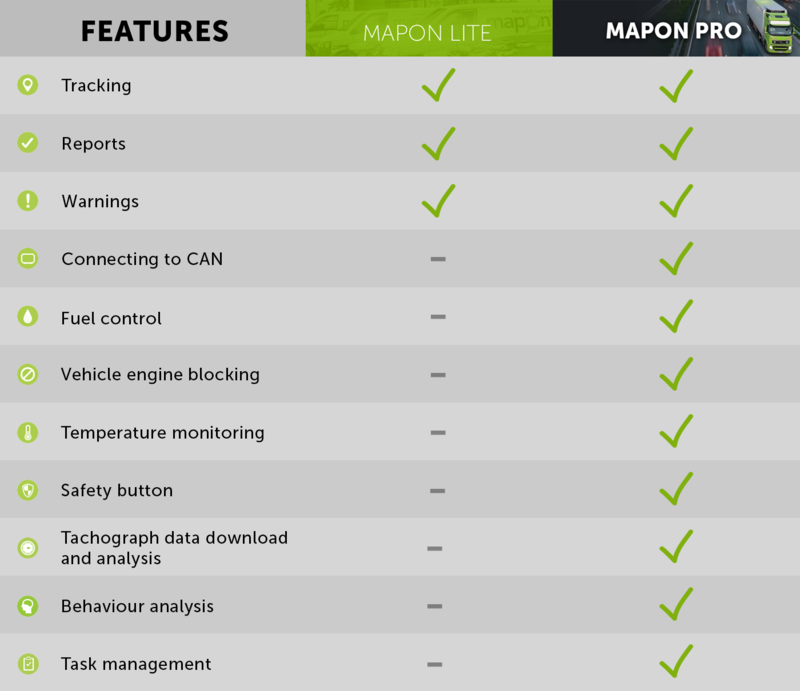 Mapon Pro is a complete GPS tracking and fleet management solution with many advanced features and full functionality, while Lite system is a simplified version with fewer functions – meant for individual use and smaller companies which don’t need a complete fleet management solution. However, both systems are built taking into account needs of their respective target audience to create an excellent user experience and make the usage and navigation intuitive and convenient for everyone. Here is a visual comparison of both systems showcasing their main features and differences. Online visual depiction on the map of vehicle location, the length of stopping, and speed. More than 20 reports about a fleet operation in various cross-sections. 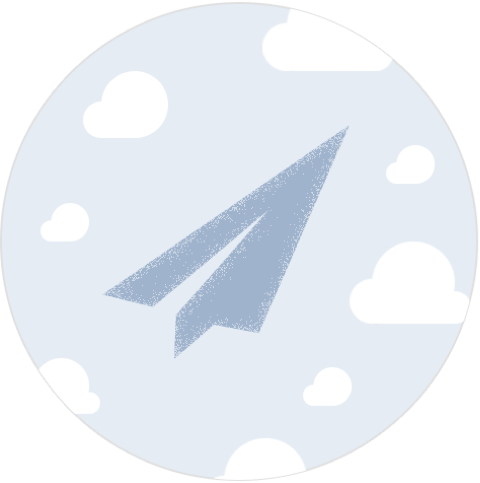 Route history, visited places, filled vouchers, and performance of working hours are only some features. Automatically generated and sent (to e-mail or by SMS) warnings will save your time and make the work more effective. There are many different warnings available in the system, for example, exceeding the speed of the vehicle, entering a particular place, failure to comply with working hours, or approaching the end of insurance validity. Mapon offers to connect to the truck onboard computer and remote transmission of information about total mileage, engine revolutions, consumed fuel, and other essential indicators. Additional fuel meter built into the fuel tank of the truck will provide you with real-time information about the amount of fuel in the tank, average consumption, and fuelling and discharging events. This feature provides extra security in emergency situations by allowing you to remotely block vehicle’s engine. Engine blocking, of course, is not possible while the vehicle is driving or standing with ignition on, but it can be used to block the engine while it’s turned off, which will make it impossible to turn on ignition. This works as an additional safety measure for worst case scenario, such as a stolen vehicle. For vehicles the cargo transported by which require maintaining a particular air temperature, Mapon offers an additional temperature measuring device, the indications of which can be viewed by the client in the Mapon system in real-time. This offers a solution if an accident does occur. The safety button can be easily activated and will send an emergency warning to the system, visible by all dispatchers and managers. It can also be combined together with Engine Blocking feature – so that in case the driver presses safety button, the vehicle’s engine would be blocked so, for example, in the case of theft – the criminal can’t turn back the vehicle’s engine. Remote digital tachograph data download and DDD file download, as well as analysis. These features with many other features are included in our Tachogram solution, which comes with a unique application for drivers. More information can be found here. Driver behavior analysis tools allow you to monitor rapid acceleration, aggressive driving and idle times. Mapon Go app allows you to manage and stay in control of your field workers. Manage your tasks with ease, instantly dispatch and schedule jobs for your field workers and follow status updates.